Pan mee or flat noodle is another Malaysia born food. This Hakka style noodle is easily available in KL. Traditional pan mee comes in soup based broth with flour made flat noodle, dried anchovies, minced pork, mushrooms, sweet potato leaves and topped with fried shallots. It goes well with chili sauce. Since the noodle is made from dough of flour, some locals prefer the dough kneaded to pieces. They looks like “Playdoh” like dough in white colour and boiled till its cooked and served with the ingredients. Traditional pan mee goes down to the broth and the quality of the noodle for the best taste. Some loves it with lots of crunchy fried anchovies while some loves it with lots of minced pork. Pan mee can be easily found in food courts/outlets and specialty restaurants such as Jojo Pan Mee restaurant, Face 2 Face and many more. Chilli Pan Mee is another version of pan mee that is now very popular in KL. 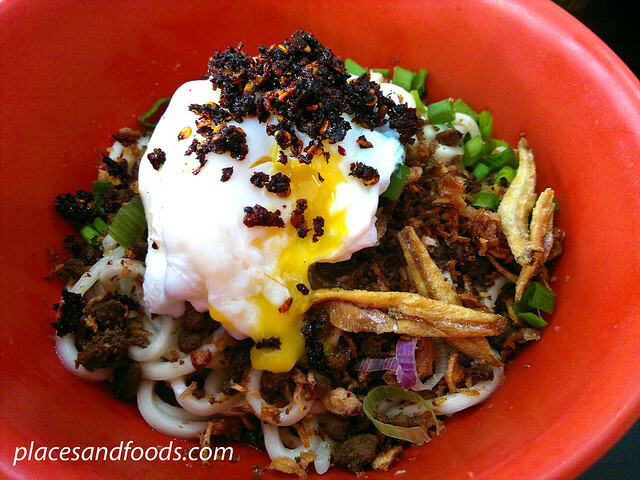 Using the same noodle, chilli pan mee is the dry version with pork lard, minced pork, chili flakes and a poached egg. Thus, it comes with soup of sweet potato leaves. This is extremely addictive if spicy is in your dictionary. You can easily have two bowls of chilli pan mee. You can find it in most pan mee stalls and some specialty restaurants such as Kin Kin Noodle restaurant. 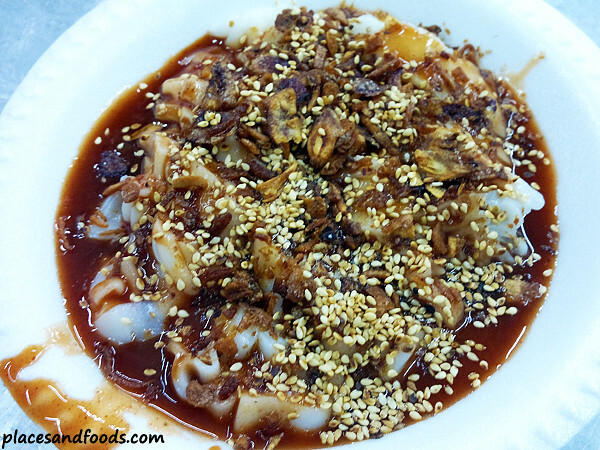 Chee Cheong Fun is a hybrid of cheong fun with yong tau fu. It is one of the most common Chinese street food in KL especially on bikes converted stalls. The cheong fun used is usually premade and it comes in two types, the round shaped cheong fun and the flat shaped cheong fun. Now, a third common type is the flat shaped cheong fun with chopped spring onions. It usually eaten with many premade food such as stuffed tou fu, foo chook (beancurd skin), lady’s finger, red chili, bitter gourd, brinjal, pork meat ball, fish ball and fish cake. Now, there are more varieties available. Some stalls now offer to refry the food and deep fry the stuffed vegetables. It is usually served within a plate and compliment with thick sweet sauce or curry broth and topped with chilli sauce, sesame seeds and fried shallots. Due to the high rising cost of food, there are lesser stalls now offer fried shallots. Chee Cheong Fun is easily available in many areas in KL especially in food courts/outlets as well as converted bike stalls. 45, Jalan Brunei Barat, 55100 KL.